Bischoff, C. and Tshoaedi, M. (2012) ‘The experience of conducting a longitudinal study: the COSATU Workers' Survey, 2008’, in Buhlungu, S. and Tshoaedi, M. (eds), COSATU'S Contested Legacy: South African trade unions in the second decade of democracy. Cape Town: HSRC Press. Callebert, R. (2012) ‘Rethinking the underclass: future directions in Southern African labor history’, International Labor and Working-Class History 82: 136–42. Callebert, R. (2014) ‘Transcending dual economies: reflections on “Popular economies in South Africa”’, Africa 84 (1): 119–34. Legassick, M. (1974) ‘South Africa: capital accumulation and violence’, Economy and Society 3 (3): 253–91. Leibbrandt, M., Finn, A. and Woolard, I. (2012) ‘Describing and decomposing postapartheid income inequality in South Africa’, Development Southern Africa 29 (1): 19–34. Nattrass, N. and Seekings, J. (2001) ‘“Two nations”: race and economic inequality in South Africa today’, Daedalus (Spring): 45–70. Nattrass, N. and Seekings, J. (2013) ‘Job destruction in Newcastle: minimum wage-setting and low-wage employment in the South African clothing industry’ (unpublished paper). Seekings, J. (2003a) ‘Social stratification and inequality in South Africa at the end of apartheid’, Working Paper 31, Centre for Social Science Research, University of Cape Town (March). Seekings, J. (2003b) ‘Do South Africa's unemployed constitute an underclass?’, Working Paper 32, Centre for Social Science Research, University of Cape Town (March). Seekings, J. (2011) ‘Race, class and inequality in the South African city’, in Bridge, G. and Watson, S. (eds), The New Blackwell Companion to the City. Oxford: Wiley-Blackwell. Seekings, J. and Nattrass, N. (2002) ‘Distribution, redistribution and the class structure in post-apartheid South Africa’, Transformation 50: 1–30. 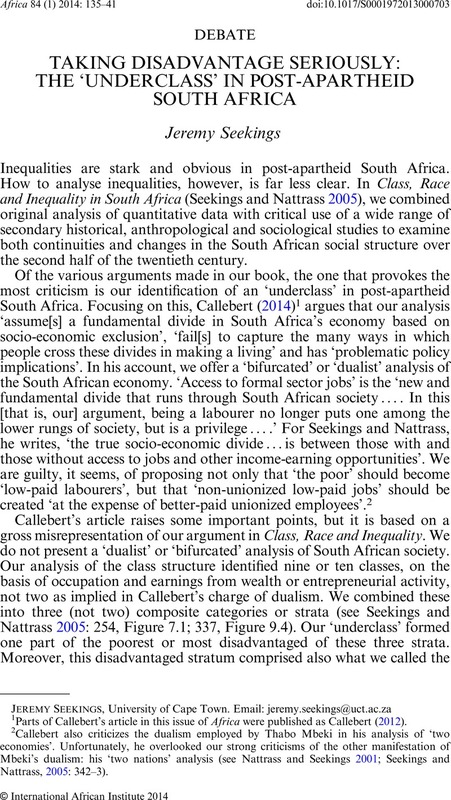 Seekings, J. and Nattrass, N. (2005) Race, Class and Inequality in South Africa. New Haven CT: Yale University Press; published in South Africa in 2006 by University of KwaZulu-Natal Press. Wolpe, H. (1972) ‘Capitalism and cheap labour power in South Africa: from segregation to apartheid’, Economy and Society 1: 425–56.